I wanted to try and blitz through a quick project before continuing with my Red Betty dress and starting the next couple of makes I have in mind. 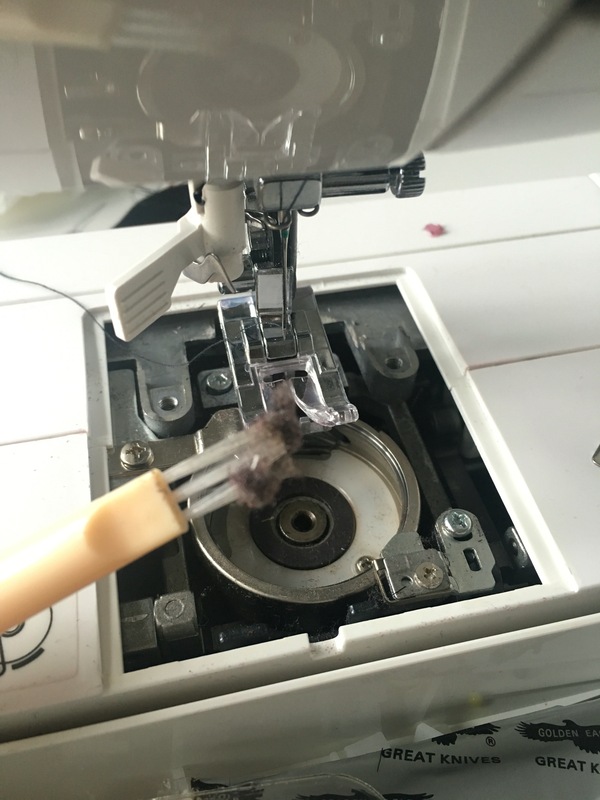 So imagine my horror when I got started and found that my machine was acting up – skipped stitches, the bobbin thread not catching the top thread etc. It was a hot mess, and it had never happened to me before! Now, I’m not a hands-on technical person. I’ve been sewing for four months now but with my little boys I haven’t had time to make all that many things. So I thought I’d be able to get by for ages before having to do anything as scary as cleaning my machine. But, since I wasn’t going to be able to make any progress on any of my projects, I decided to bite the bullet and get on with it. Out came the manual and the little screwdriver tool, and I got to work. Sixty seconds later, I was done! It was actually a bit of an anti-climax 🙂 so to any newbies like me who are afraid to do it, don’t be! I am slowly coming to the realisation that with sewing, everything that seems scary and difficult before you try it, turns out to be not so bad once you jump in and just try it. I have learned so much in the past few months since I first picked up “Love at First Stitch” and decided to make something. Inserting a zip, changing the presser foot, changing the needle, sewing buttonholes and shirt plackets, interfacing, and now cleaning my machine.. I’ve come so far! Don’t get me wrong, I know I’ve got a loooong way to go, but it’s empowering to realise I can do this! And trust me, if I can, you can too! To anyone who’s afraid to try, and is standing by the poolside afraid to dip your toe in – be brave! Be bold! Try your hand at that new skill – practice on something cheap and easy! Develop yourself into the person you want to be, or acquire the skills you want to have, one small step at a time. DO try this at home, folks, and don’t look back! ← Work in progress: Red Betty!